Spite in favor of Mikaboshi. Hard counter to MJJ even before his height of power as the chaos king, which is so far above these guys. Reality warping team murders him, Legion doesn't belong here. Franklin Richards got wrecked by Entropy IIRC, and the Jaspers warp is quite reversable since it is slow as $hit and can just be cut as a timeline altogether. Mikaboshi is the other half of Multi-Eternity and is an avatar of Multi-Oblivion, who was the real villain behind all of Eternity War. I'm pretty sure most of the abstracts above and at Master Order and Lord Chaos are multiversal now. Otherwise they would never have become Logos/killed and replaced LT.
Aren't there like 9 Multi-Eternities? Or was it 8? 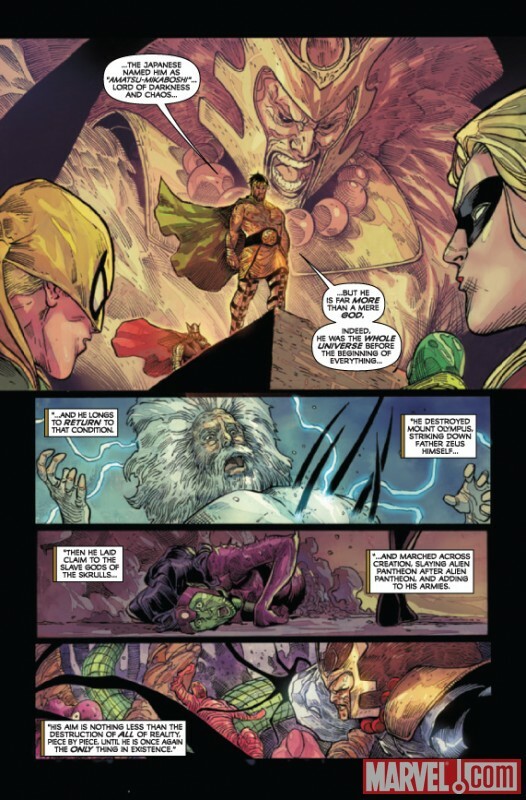 Chaos King being Multiversal was debunked, the writer himself seems to be confused with the term Multiverse and Universe, with that said, the reality warping team destroys him. @etriel: I'll just post the entire debunk here. Did you find this event frustratingly confusing with poor use of characters and lack of description the way I did? I mean where the hell was Tribunal, Phoenix, Celestials, and all the other abstracts in this? Well that's because it wasn't a multiversal conflict. Here is the proof and some reasons why. Cho explains universe. He didn't effect the other universes yet. Which all kind of contradicts or debunks this doesn't it? 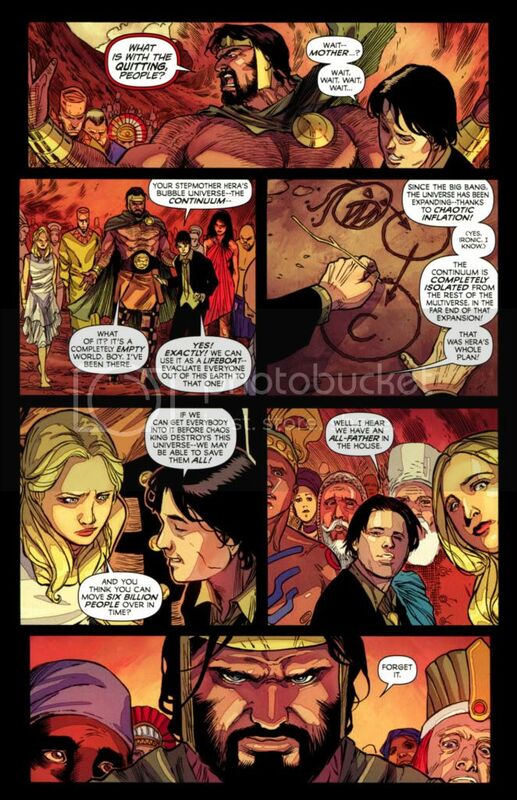 Hell I refuse to believe he is a multiversal destroyer because No abstracts were to be found stopping him, No tribunal, and hell it took him so much time consuming one universe and then in a few pages afterwards we are told by the words of Amadeus Cho (NOT BY NARRATION WHICH IS FAR MORE VALID) that he destroys 98% multiverse????? How the hell does he know what size is the multiverse? Not even Reed Richards can count it!!! Doesnt it keep growing? He took all that time with one universe but so quick with all the others if he really did? I mean WTF!!! We didnt even see the guy trash other universes or other realities versions of characters in 616!!! Even if the multiverse thing is true the fact that all the other universes failed while only the 616 earth remained and were the only ones to beat him makes the MU seem kind of insignificant. I cant provide a scan here because we were talking about the multiverse in chaos war. Which was never shown! WOWOWOWOWOW! So if the Multiversal feat is nothing to oblivion how powerful is he compared to chaos king? Like 100% Multiverse destroyer? No he said he was just an aspect so it must be higher. That only means oblivion is an Megaversal destroyer which is FALSE. Proving chaos king Multiversal feat is wrong! Also this chaos kings goal was to make the universe as it once was. Get that? UNIVERSE. Not Multiverse. UNIVERSE. All the more reason to point out that he was only taking apart the 616 universe! Chaos King was happy. When he got a universe! One Universe!! Hell they defeated the guy by tossing him into a universe. If the guy managed to enter and leave all of the universes and dimensions. Then why couldn't he get out of that one? They say he got what he want but in truth he got a universe smaller then ours and could have made any of his dimensions he destroyed his own and stayed there but no. Then suddenly he changes his mood and settles for far far less? lol. Its full of misunderstandings, missing characters, confusion and lets not forget character stupidity. Like damn Hercules you called upon Galactus for help? When you could have called in infinity and others? WTF? And Gaea's couldn't have done what she done earlier? Couldn't the other Gaea's in the other universes done the same thing? What were they all standing around like sheep? And they had better odds due to the fact he consumed less. y the way there is no way Gaea could give someone thee power to fix a multiverse. Nor having Thor hurt him if he did consume the multiverse. It was a universe. And Athena was behind all this???? She was actually risking all of creation just so Hercules could rule over everything? And guess what? He turned it down! What a waste of time and effort! She was that desperate for him??? Sorry Athena Hercules is taken! She just showed the entire MU how much of a crazy b$tch she is! Chaos King NEVER DESTROYED 98% MULTIVERSE! Hell a fight between skyfather herc and chaos king would destroy the earth! Who Knows maybe it was a mistakes the writer wrote Multiverse. Take it as you will, I don't think it makes Chaos King any less of a threat, it's just that Chaos War as a comic has way too many contradictions and Chaos King being Multiversal shouldn't be taken at face value, I've read the comic thrice now for my own satisfaction and we've never seen him destroy the Multiverse or any of the Universes, the only time we ever see him portray Universal feat is on the last panel where he taints the entire Universe with void, other than that, nothing suggests he's Multiversal. Choas King loses with the people he's going up against.